Asclepias curassavica is without a doubt the best milkweed species for greenhouse culture or the home garden. It attracts Monarch Butterflies and is tolerant to occasional over-watering. It is native to tropical America. Blooming Time: All year. Its blossoms are are red and orange, less than an inch across, and appear in clusters at the top of 2 to 4 ft. stalks. Culture: Asclepias curassavica require a sunny spot in moist, fertile soil. Blood-flower is not as drought tolerant as other species of milkweeds. Keep the plants uniformly moist, but not saturated. Pinch the tops of the plants to induce a bushy habit and provide more flowering branches. Once a week fertilize with a balanced fertilizer such as 20-20-20 diluted to half the strength recommended on the label. Propagation:Asclepias curassavica produces a robust plant when started from seed. It can be propagated from cuttings of green stem cut underwater and treated with rooting hormone. The stems are then placed in vermiculite or in potting soil kept continuously moist. 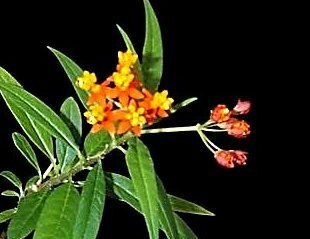 Asclepias curassavica was featured as Plant of the Week February 26-March 4, 1999.